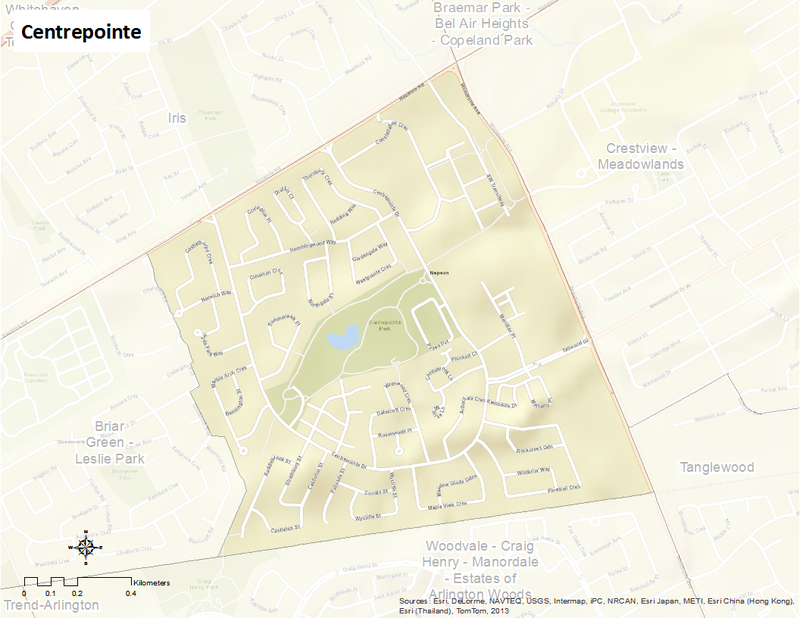 The Centrepointe neighbourhood lies within the boundary of Baseline Road to the north, just south of Pineview, Mapleview and Wycliffe Crescents, Woodroffe to the east, and just west of Marble Arch Crescent. This neighbourhood is a newer residential subdivision that was developed in 1985. Previously farmland, it was purchased by the Canada Mortgage and Housing Corporation, which let the land lay fallow for many years. Most of the land was sold off to Ottawa’s largest housing developer, Minto Corporation, which built and sold off a wide range of homes from townhouses to large upscale houses. The neighbourhood’s major attraction is Ben Franklin Place, named for the former mayor of Nepean, which houses the Centrepointe Branch of the Ottawa Public Library, the locally renowned Centrepointe Theatre, and the former Nepean City Hall (now housing satellite offices for the City of Ottawa). The neighbourhood has a significant Jewish population. There is an active community association, formed in 2006. Here’s an infographic that describes Centrepointe as a Village of 100 (2011 data).